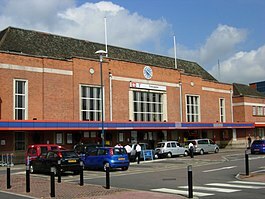 Doncaster railway station serves the town of Doncaster, in South Yorkshire, England. It is situated on the East Coast Main Line 156 miles north of London King's Cross and managed by Virgin Trains East Coast. It is a major passenger interchange between the East Coast Main Line and Cross Country Route and local services running across the North of England. It is also the point for which Virgin Trains East Coast services from London divide, either branching off to Leeds or continuing north to Scotland via Newcastle and the North East. Doncaster railway station serves the town of Doncaster, in South Yorkshire, England. It is situated on the East Coast Main Line 156 miles (251 km) north of London King's Cross and managed by Virgin Trains East Coast. It is a major passenger interchange between the East Coast Main Line and Cross Country Route and local services running across the North of England. It is also the point for which Virgin Trains East Coast services from London divide, either branching off to Leeds or continuing north to Scotland via Newcastle and the North East.